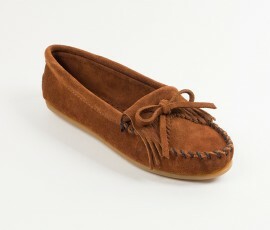 Soft, supple suede moccasin with a little fringe on top with suede lace. The moccasin has a fully padded insole with a lightweight sporty rubber sole. I bought a pair of these at Santa Fe Craftsman in 2005 and still wear them every winter. They are comfortable and still look good. Excellent value.